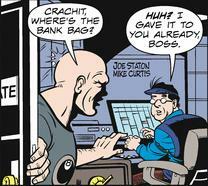 Crachit was a book-keeper at Cueball’s club who kept the receipts and had them delivered to the bank each night. It is unclear if Crachit was aware of his bosses other illegal activities or if he was a normal employee. When Putty Puss disguised himself as Cueball, Crachit turned over the night’s take to him and was surprised when his boss showed up asking about the receipts again. This tipped Cueball off that they had been robbed and he chased Putty Puss down to the back entrance where the two shot each other. Cueball was killed and Putty Puss badly wounded. The police raided the club the same night, it’s unclear what happened to Crachit.